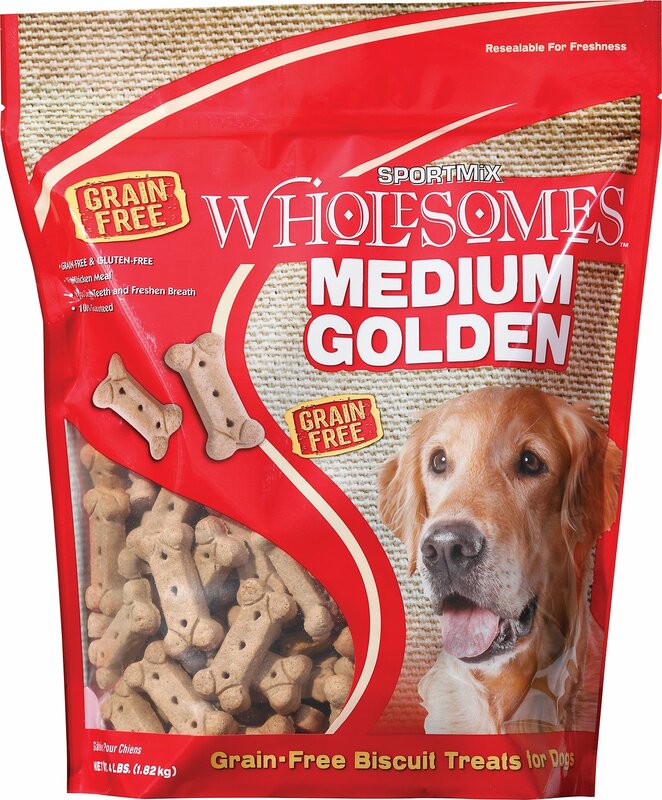 SPORTMiX Wholesomes Golden Dog Treats are a great way to reward your pup while providing a delicious supplement to his diet. These grain-free and gluten-free biscuits pack the nutrition dogs need and the taste they love, with a crunchy texture that helps remove plaque and tartar to support healthy gums. 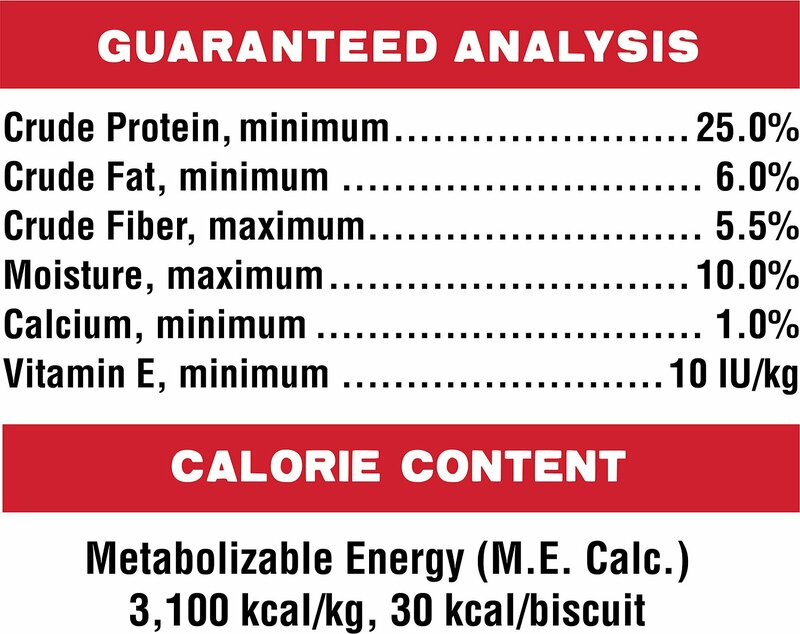 SPORTMiX biscuits are naturally preserved and contain high-quality ingredients that are fortified with vitamins and minerals for a treat you can feel good about. Made with chicken meal for a protein-rich treat you can feel good about. 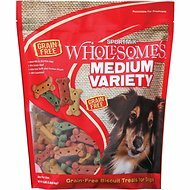 These crunchy biscuits are specially formulated for medium-sized, adult dogs. 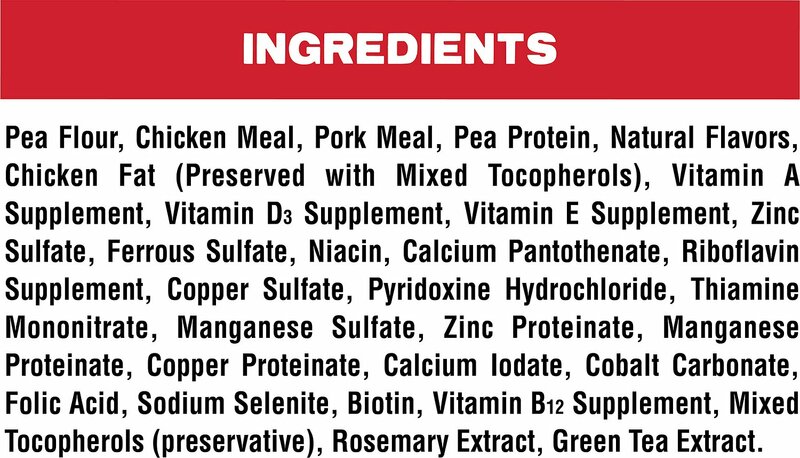 Pea Flour, Chicken Meal, Pork Meal, Pea Protein, Natural Flavors, Chicken Fat (Preserved with Mixed Tocopherols), Vitamin A Supplement, Vitamin D3 Supplement, Vitamin E Supplement, Zinc Sulfate, Ferrous Sulfate, Niacin, Calcium Pantothenate, Riboflavin Supplement, Copper Sulfate, Pyridoxine Hydrochloride, Thiamine Mononitrate, Manganese Sulfate, Zinc Proteinate, Manganese Proteinate, Copper Proteinate, Calcium Iodate, Cobalt Carbonate, Folic Acid, Sodium Selinite, Biotin, Vitamin B12 Supplement, Mixed Tocopherols (preservative) Rosemary Extract, Green Tea Extract. My two Malamute/Shepherd mix dogs love them. I like what is not in the treats and my picky girl loves them. We do a lot of off-leash roaming so a pocket full of tasty treats is essential to helping them "stay in their lane" when encountering other people and dogs. This biscuit is a good size for my 15-20 pound babies. 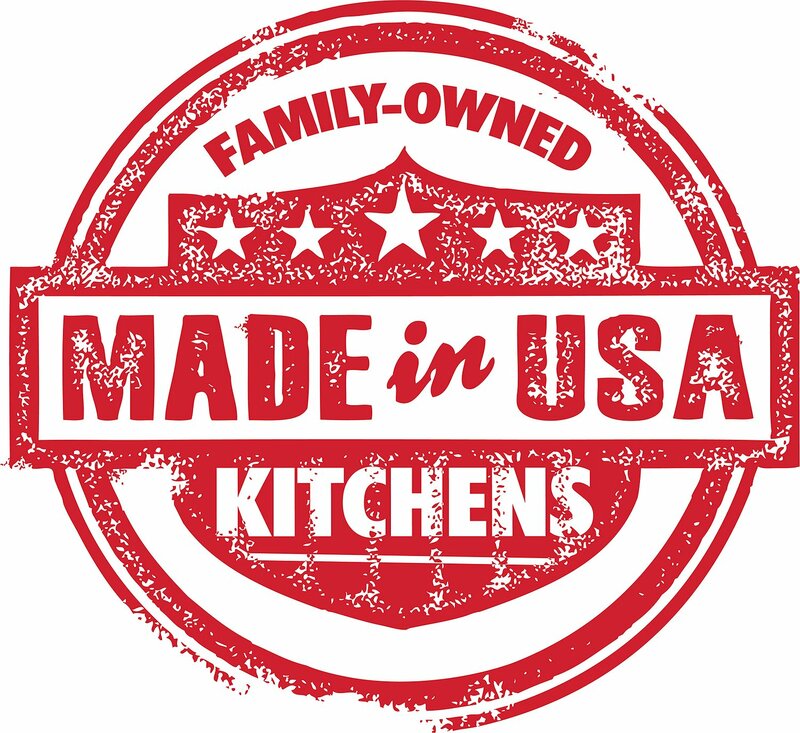 The ingredients are impressive and my babies really like them. I will purchase them again. I have two dogs one really like the biscuits the other will eat but could care less. My problem with the biscuits were they looked as if they had been dropped off the house. out of 20 pound, a third of them is broken into very small pieces. Grain free and my dogs love it! 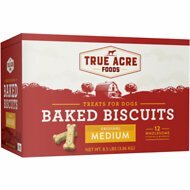 First dog free biscuits I could find at a great price! Fantastic healthy treat for a great price! These treats go a long way. Good size and the dogs love them. They are a bit hard to break in half but still a great treat for the price. I have 2 mastiff mix dogs and 1 thirteen yr old lab. All loved them. The bag came and the most of the bones were broken into pieces. At first I was disappointed but then realized how large the bones were, and hard. I was glad because normally I break apart the bones and give them pieces at a time. All of the dogs loved, loved, loved them. They r kinda thick and tough not recommend for older dogs. My dog had a hard time with them. The younger smaller one took her a bit to eat. They r really hard and thick. Good size u do get alot. My dogs did eat them it just took them a minute. They didn't get excited like they do for other treats. This is Definitely not their favorite one.